A wonderful gift idea for any new baby girl or boy, our Neutral Gender Rocking Pony Gift Set is also a perfect baby shower selection when the baby�s gender is unknown! We begin this collection on a wooden rocking pony with a clear finish to accentuate the natural wood grain. 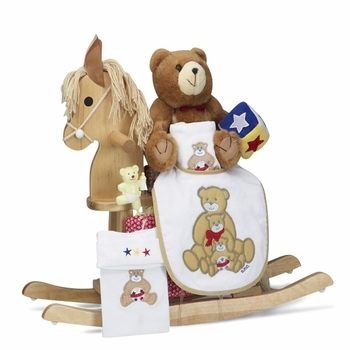 Built of solid wood, the pony is quite sturdy and will provide many years of rocking fun. It stands 24 inches tall while the base measures 25 by 10 inches. Please note: for safety, children under 3 should always be supervised by an adult when riding. To complete the set, we then add some cute teddy bear themed baby necessities, a diaper tote bag, a rattle, a teething toy and a little plush teddy bear. Once finished, we gift wrap the entire set in white tulle fabric for a stunning presentation! Processing Time 1-2 business days Does not include shipping time.